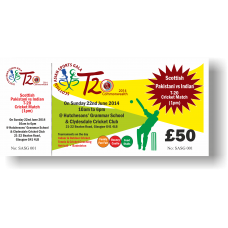 Our Premium quality Tickets for small or large events, in both a professional and personal way. Whether you need to include a short message with a product or letter or perhaps you want to send a gift to a corporate client, our range of tickets will add that personal touch without compromising your brand. Serial Numbering and perforating facility available on request. We can stamp UV Mark for security purpose. Please Note Runs below 500 copies are printed digitally and are only suitable for use with inkjet printers. Runs of 500 or more are printed litho making them compatible with both inkjet and laser printers.